In a previous post I listed a number of Arabic dictionaries available online. For anyone interested in searching a broad array of dictionaries, both classical and modern, there is now one source for 51 different sources. This is the website http://lisaan.net/. In addition to the major lexicons of al-Fayrūzābādī’s al-Qāmūs al-muḥīṭ, Ibn Manẓūr’s Lisān al-‘Arab and al-Zabīdī’s Tāj al-‘arūs, there are many more available, not to mention Ibn Sīda’s thesaurus and Yāqūt’s geographical lexicon. Both Lane’s Lexicon and Dozy’s Supplément are there. You can search all of these sources at once or just in an individual work. 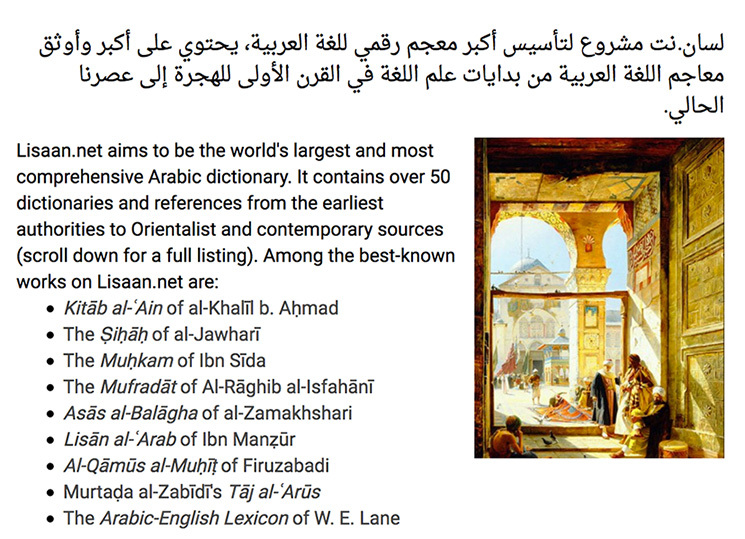 To say that this is an incredible resource for anyone who works with Arabic, is an understatement.